Alright, I admit it. I drive a Toyota Camry, and love it. It’s got the room of a Falcon or Commodore, but the fuel efficiency which comes with a four-cylinder engine and it’s a pleasure to drive, albeit with less power for overtaking. My Camry has done nearly 100,000 kilometres, and absolutely nothing has gone wrong with it – except for the time a son backed it into a carport pole. Same with my parents’ Toyota Corolla from the early 80s – it did a stack of miles in both country and city, and the only thing that ever failed was a clutch spring. So it comes as no surprise to this reviewer to hear the anecdotal reports of the great reliability of the Toyota Coaster. And it’s no surprise on driving it to experience the good performance of the 4 litre diesel engine, along with the comfort, ride and handling. The only surprise with the Coaster is that after all these years on the Australian market, there appear to be still a few minor downsides. More about them later. The Coaster has been on the road in Australia in one form or another for nearly 40 years, and in that time has sold more than 20,000 units. It looks a bit old-fashioned but clearly gets the job done well. Last year the venerable model had an upgrade. Most importantly and not before time, the lap sash seat belts were replaced by three point seat belts, with emergency locking retractor. 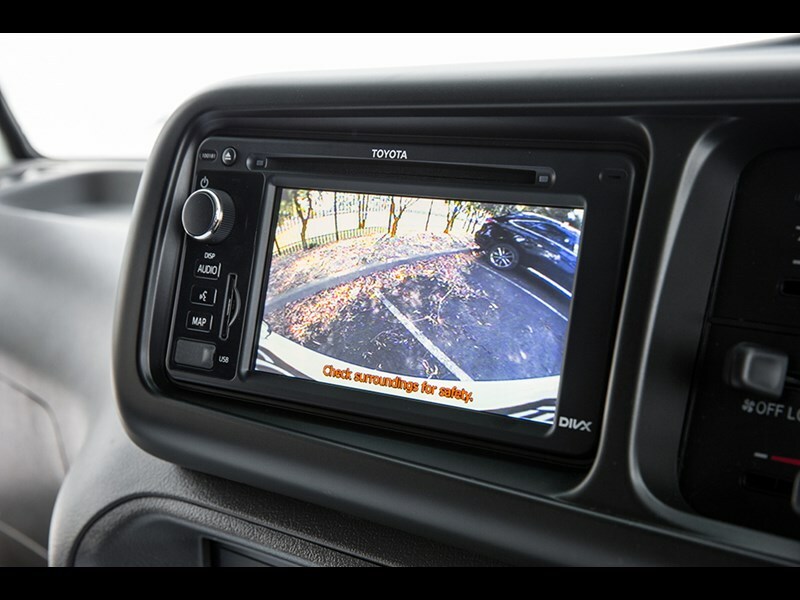 A reversing camera is now standard, and they are a very handy gizmo, including for a couple of tight manoeuvres on our drive. Satellite navigation is also standard. There is a voice recognition function to control key aspects of the satnav, audio system and connected smart phone. I didn’t check that out but the USB port was very handy for charging my phone. 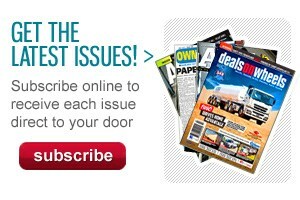 Like my Camry, there is a capped service price for the first three years or first 60,000 kilometres. It’s $360, which seems like a good deal. Mind you, that 10,000 kilometre service interval seems a bit on the low side in this day and age. 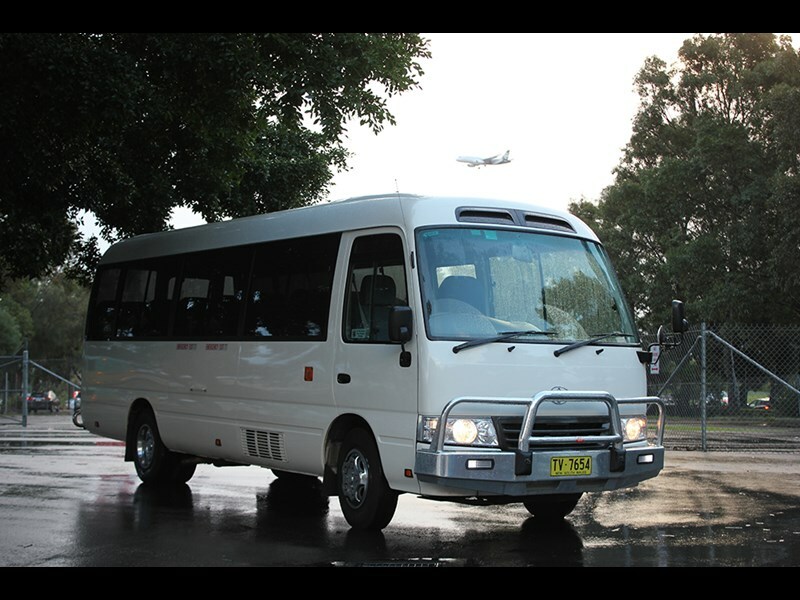 We took the Coaster to one of its natural habitats – the airport – then onto the freeway and back to base via some urban arterial roads in Sydney. Beside the driver is Toyota’s trusty 4 cylinder, 4 litre turbo diesel which puts out 150hp (110kW) and 400Nm of torque at 1800rpm. That looks very modest on paper but the little bus drives really well, with good acceleration off the mark and it easily keeps up with the traffic. On the freeway our unit "coasted" (get the pun?) along nicely at the speed-limited 100 kilometres an hour on 2300rpm, and didn’t sound or feel like it was working hard at all. The engine ticks over nicely and is relatively quiet. 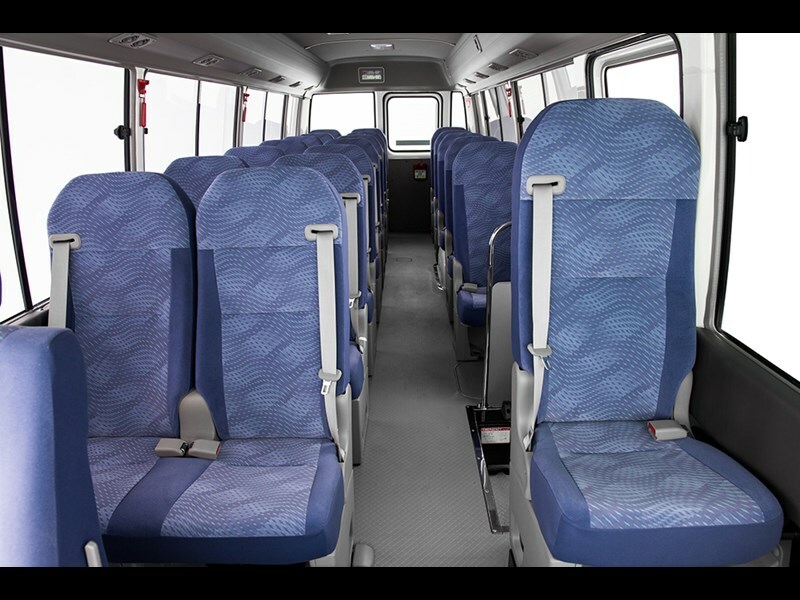 There is also relatively low noise and no vibration for passengers up the back. We drove the deluxe version with Toyota’s 4-speed fully automatic transmission, and it’s matched nicely with the engine. What I particularly like about the transmission is the little "overdrive" button on the handle mouseclick can think, which might better be termed the "power boost" button. When you press it in with your thumb in top gear the gearbox kicks back, just like in the old VL Commodores. 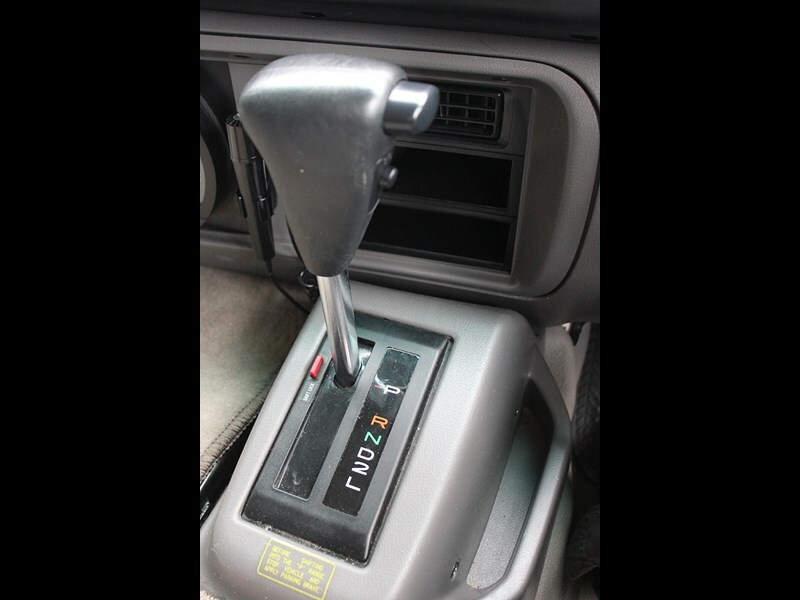 It’s much easier and quicker than yanking the whole gearstick into manual mode, and gives you that extra grunt to maintain your speed up a rise. The ride is excellent, thanks no doubt in part to the long rear leaf springs and independent front suspension (with double wishbones and an upper torsion bar). There is no suspension seat for the driver, but running over lots of speed humps, a few potholes and even a railway line was no problem for the old spine. The steering and handling in the wet was good and the brakes do a good job, with ventilated discs at the front and drums on the rear. The parking brake holds very firm even though it’s not air operated. The turning circle seems very good, and it is, at a touch over 14 metres. A six footer on the old scale can stand to their full height inside the Coaster, which you wouldn’t pick by looking in from the outside. The deluxe model’s cloth seats are very comfortable, with backs which are if anything a little too high, in terms of blocking the driver’s vision of naughty kids up the back. But better to be too high than too low in case of whiplash. There is good lumbar support in both the driver and passenger seats. 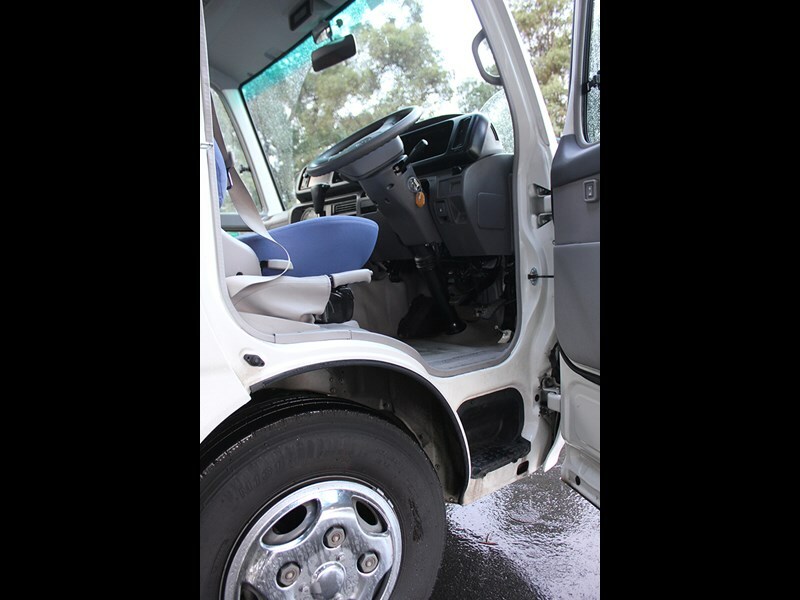 There are two passenger positions over the rear wheel humps, which would be no problem to a small person, but for others it feels like your knees are tucked up to your chin. On the other hand there is a huge amount of leg space in front of the single passenger seat up the front. At first glance it looks like a wasted space, but it’s no doubt a very handy and safe spot to put luggage. After all, luggage space is at a premium, with no room behind the rear row of seats. That’s why you see so many Coasters pulling a trailer. Towing capacity is two tonnes (braked). The privacy windows are quite large, and can be opened – which is a great thing for adults but maybe not so good for kids. 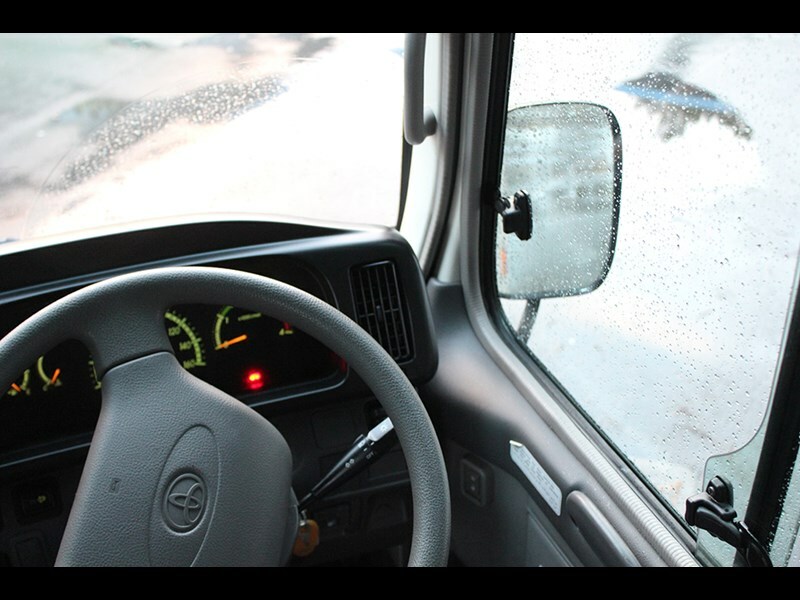 The sliding cabin door in the deluxe model can be operated either in manual mode or in auto from the driver’s seat, and worked well either way. There is a buzzer to let everyone know it’s in action. There is good three-point contact for the driver to easily get in behind the wheel through their own door. In our humble opinion both mirrors either need to be taller, or be supplemented with spotter mirrors. That’s because you can adjust the right mirror to see either the rear wheel or the traffic behind you, but not both. Meanwhile the pillar over your right shoulder is in a nuisance position, which means if you want to double-check there is no one in your blind spot, you either have to lean right forward or lean right back to look down. It was hard to tell if the exhaust brake was actually working, but on the other hand there were no hills involved in our drive and we had no weight on board, the only other occupant being ABC videographer Barry Ashenhurst (who also had a stint behind the wheel and was also very impressed overall). There is no height adjustment on the driver’s seat, and I personally felt a bit low; so a really short person might feel like that funny little graffiti man you sometimes see around, with just his or her hands and nose visible above the steering wheel. I must admit I didn’t try very hard but I couldn’t work out how to work the factory air conditioning properly, which was a bit of an issue when we fogged up in the rain a few times. The controls don’t seem intuitive. Luckily there is a small window in easy reach for unfamiliar drivers. I couldn’t find the slide-out cup holders either but they are there somewhere. Last but not least for buyers, this little bus is no doubt a great investment but the recommended retail price does seem a bit on the dear side. 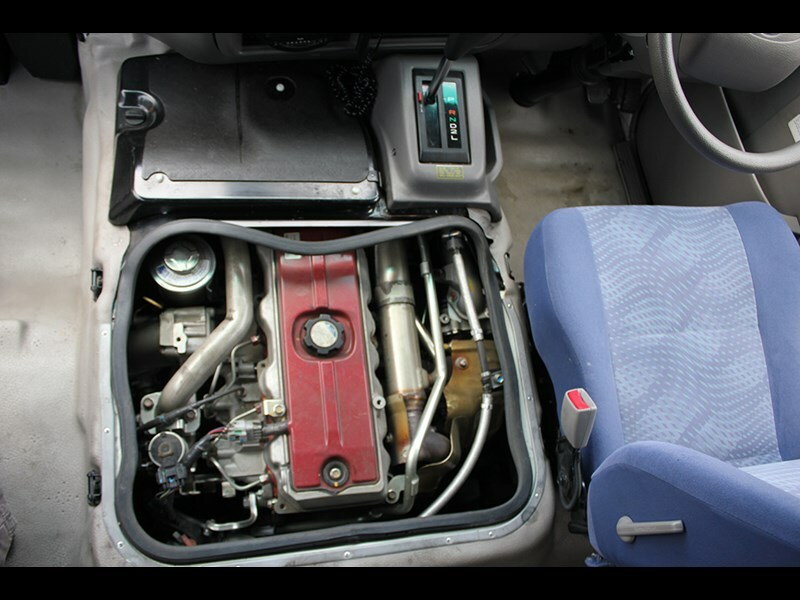 That’s especially when compared with Chinese competitors; and when compared with smaller van-based minibuses from Europe and even Toyota’s own Hiace-based "Commuter", which boast electronic safety technology. The Coaster has ABS but that’s now required under the Australian Design Rules anyway. The standard version is priced at a touch over $114,000 (including air conditioning) with the deluxe manual setting you back $118,000; and the deluxe automatic $125,000. 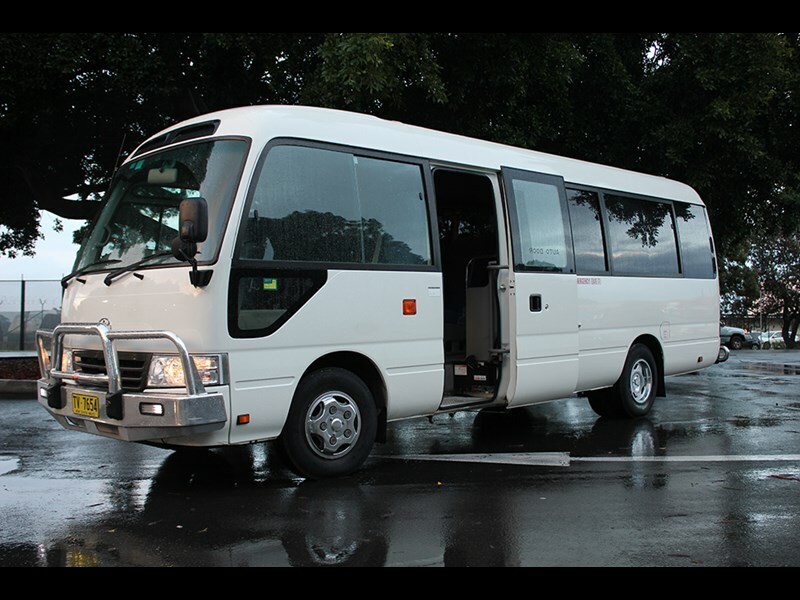 2010 TOYOTA HIACE (ONLY 24,000 K'S), WHEELCHAIR, TURBO DIESEL AUTOMATIC, HIGH ROOF MINI BUS. 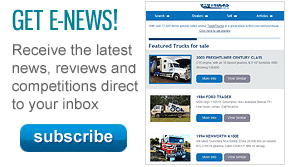 "It’s no surprise on driving it to experience the good performance of the 4 litre diesel engine"